Fred Strebeigh is a beloved teacher of nonfiction writing at Yale. Some of today’s most influential American journalists are his former students. With Equal, he has delivered a refresher course for them and the rest of us about a fundamental element of valuable nonfiction: deep, sustained, omnivorous reporting. 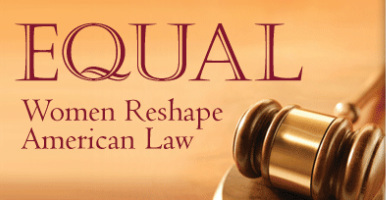 This volume reflects a decade of immersion in never-before-examined Supreme Court papers, essential library archives, and lively conversations with the architects of landmark cases that have hastened and impeded progress toward equality between women and men. Equal is sympathetic to the cause yet even-keeled, steeped in the nuances of the law yet inviting to those unschooled in its arcana. It is an ambitious and admirable contribution to the annals of American justice. The mixture of Strebeigh’s ardent curiosity about his momentous subject and the freshness of the battles that he chronicles make the book a revealing work of living history. -- Lincoln Caplan, author, The Tenth Justice: The Solicitor General and the Rule of Law and other books about the law; former editor and president, Legal Affairs magazine, and editorial board member, New York Times. "[Justice Ruth Bader] Ginsburg is one of the central figures of Fred Strebeigh's monumental new book, Equal, which tells the story of women's struggle for equality through the courts and their rise in the legal profession . . . . Remarkably, Ginsburg granted Strebeigh open access to her pre-judgeship files, a decision that turned an excellent book into an indispensable one . . . . Even though Strebeigh tells these litigation histories extraordinarily well, it's his detailed research and knack for piecing together tales of backstage advocacy that make Equal such an outstanding book."